Serious car accidents often leave those involved with serious or debilitating injuries. Ruptured or herniated discs are examples of potentially debilitating injuries that accident victims might suffer. The location and symptoms of a ruptured disc may vary, and treatment is available in many forms. If you have injured your back in a car accident, read through the following to determine whether you may have suffered a ruptured disc. The spine consists of 24 vertebrae aligned atop each other. Through these bones runs the spinal cord, which the vertebrae protect from damage. Even simple actions such as walking or jogging send shockwaves through the spinal column. 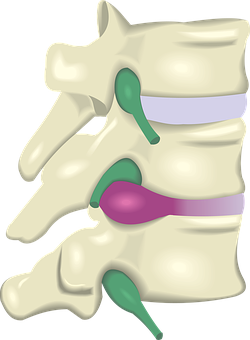 So in between the vertebrae are gelatinous discs, known as intervertebral discs, which act as cushions between the bones. The American Academy of Orthopaedic Surgeons (AAOS) describes these discs as being filled with a jelly-like center, known as the nucleus pulposus, which is surrounded by a thicker outer ring, called the annulus fibrosus. If an individual suffers physical trauma, such as the impact sustained in a serious car accident, an intervertebral disc may rupture, causing the nucleus to push towards the outer ring, and in serious cases, it may squeeze entirely through. If the nucleus of an intervertebral disc begins to push outwards through the outer ring, it may put pressure on the spinal nerves. If the nucleus succeeds in passing through the outer ring, the nerve damage may become more severe, often limiting movement in more serious cases. Depending on the location of the ruptured disc, as well as the severity, certain specific symptoms may appear. Symptoms of a ruptured disc may include pain or numbness in the parts of the body affected by the nerve. This can include pain and numbness in the shoulders, arms or chest if the ruptured disc is located in the neck. If the ruptured disc is located in the lower back, it might cause sciatica or pain in the buttocks, legs, ankles and feet. How Does a Doctor Diagnose a Ruptured Disc? Once a doctor suspects a ruptured disc, he or she will perform further diagnostic tests to reveal the extent of the injury, as well as the proper course of treatment to aid in rehabilitation. The AAOS provides that a doctor may begin by performing a neurological examination, testing for sensory loss and weakness in a possibly affected area, or a straight leg raise (SLR) test that helps indicate whether or not a ruptured disc is present. In some cases a doctor may recommend a magnetic resonance imaging (MRI) scan or computed tomography (CT) scan for further diagnosis. What Should I Do if I Have Suffered a Back or Spinal Injury? If you have suffered a spinal injury in a car accident, it is imperative that you seek medical treatment immediately. A doctor can help determine whether or not you have a ruptured disc or if you suffered a more serious injury affecting the spinal cord. The sooner you seek treatment, the sooner the doctor can begin treatment. In fact, even if you do not feel injured, seek medical evaluation anyway because some injuries may not be readily evident. You can recover damages related to your ruptured disc or herniated disc by filing a personal injury claim against the at-fault driver. Once you have spoken to a medical professional, contact the attorneys at Walker, Billingsley & Bair. We can help you determine the party liable for the accident and begin filing a claim to compensate you for your injuries. Call us today at 641-792-3595 or contact us online to get started.